The Browning Fishing Citori is no longer available. To find a comparable reel, please use the menu to the left. 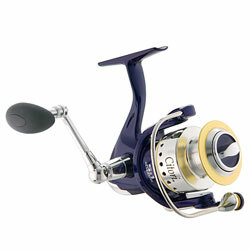 "This reel is a great deal if you catch it on sale. I own 5 of them and i have not run into any issues with them. As long as you keep up on the basic maint. they will last for years. If you grab them while they are on sale you cant beat em." "I've had one for a couple of years. It worked flawlessly until yesterday while smallmouth fishing. There is a copper ring around the shaft over the anti-reverse bearing and under the anti-reverse cover." "I've used this reel for almost 1 year and it has developed a problem with the retrieve when there is a load on the line. It feels like a gear is skipping a tooth and it is not very smooth." "I have had this reel for a while now and would have to say I am pleased with it. The drag works very well and it will cast far with little effort. I only wish they offered this reel in smaller sizes."